Rodents are naturally attracted to homes and office buildings for the opportune sources of food, water, and shelter that they provide. The attic is one of the most common places to find these critters for the dark, secluded safety it offers. Once they infiltrate your property, rodents are anything but easy to remove, which is why the experts here at Critter Control of Orlando® are here to help. Rats and mice are more than just unsettling to have in your home, they actually pose a serious risk to your family and home’s wellbeing. 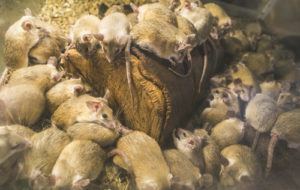 For example, rats are known carriers of potentially life-threatening diseases like Hantavirus, Salmonellosis, Rat-bite Fever, and even the Bubonic Plague. Additionally, it’s been found that rodents are one of the biggest contributors to indoor allergies in the country, accounting for over 30% of in-home allergy attacks. Rodents also put your home or office building at risk. Rats and mice are eager to rip apart attic insulation to help build their nests, hurting its efficiency and causing your energy costs to skyrocket. Rodents chew and gnaw on anything in their path, including important wooden roof structures and even electrical wiring. If you suspect that rodents have taken up residence in your attic, don’t wait until it’s too late. Rodents reproduce alarmingly quick, so a minor problem can explode out of control before you know it. Call us today at 407.295.7194 with any questions about our removal services, or to schedule your free home consutation.